You have just received your package from Aroma Seize, you open it to find the amazing aromatic products, and you pull out your first candle and light it! You might think that burning a candle is simple, but there are a few things that you might not know. 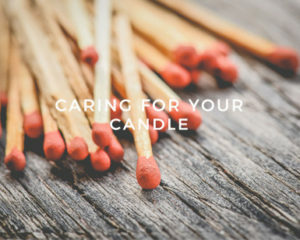 Below you will find our recommendations for getting the most out of your Aroma Seize candle. Each burn is just as important as the FIRST! The first time you burn any candle, let it burn until it reaches the edge of the container. With our standard boutique spa glass container,on average it will take about 2-3 hours. This will not only maximize the fragrance throw, but also help avoid “tunneling”—where the candle burns down the middle, leaving wax around the edges. Your candle will come to you with a quarter-inch unlit wick. If you ever receive a candle that has a longer wick, trim your wick to a quarter-inch before lighting the candle. You always want to re-trim your wick to a quarter-inch following a burn, making sure that you remove any part of the wick that has become bulbous. When your wick gets too long, the flame gets bigger and the long wick tends to curl over, displacing the flame from the center of the candle so that it ends up closer to one side. Also, shorter wicks are safer because it keeps the flame smaller. Be careful not to trim your wick too short or you might not be able to re-light your candle. Allow Your Candle to Burn for at Least 2 Hour!